CHOOSE ONE BRACELET TO FIND WHAT YOUR SUBCONSCIOUS REVEALS ABOUT YOU! Every woman loves jewelry! What could be better than a well-groomed woman’s hand! 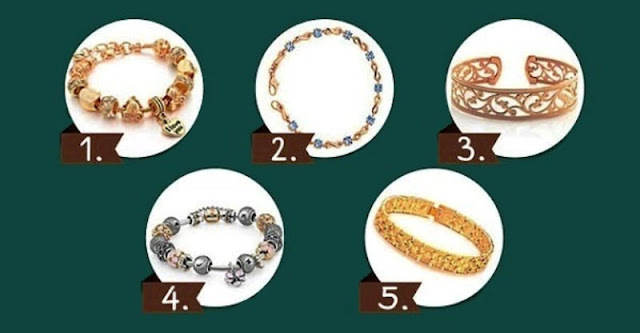 At the same time, we choose a bracelet, according to our style and mood. It turns out, our choice of a bracelet can say a lot about our personality! Purposefulness and determination are your biggest qualities. Your main life priority is to follow your dreams, desires, and goals. If you need to achieve something, you will put almost any sacrifice on the altar of success. If you have children, they are your priority and there isn’t anything you wouldn’t do for them. 2. Your friends are the most important in your life. You are one of those women, for whom friendship is not an empty phrase. You are always ready to help your friends, even when they have their biggest problems. You do not blame the persons’ inability to deal with the problems on his own, and you think it’s normal if someone who is in trouble asks for help from others. You are quite a self-contained person and don’t want to live with an open soul. In your youth, you burned yourself trusting others and now you keep any outsiders at an arm’s length and any person claiming your friendship is forced to undergo a multi-level check on trust. Yes, you are one of the very people who can’t live without caring for the people around them. Also, you are surprisingly open and sincere in your motivations and both your closest friends and casual acquaintances, as a rule, consider you as a real ray of sunshine in their life and enjoy spending time with you. You want all your affairs to go smoothly, without a hitch. Your dream is perfection in everything. You are surprisingly independent and very self-sufficient person, used to take care of yourself without someone else’s help. You are also distinguished by caution and circumspection, which are great virtues when you have difficulties in life. However, you would love to find a man who will be your main support and with him you will find joy and happiness.